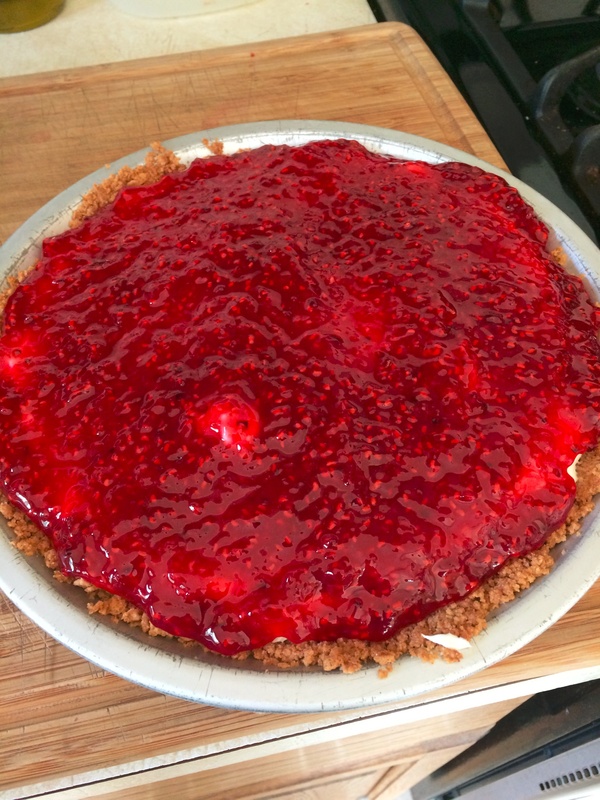 You are currently browsing the tag archive for the ‘raspberry pie’ tag. 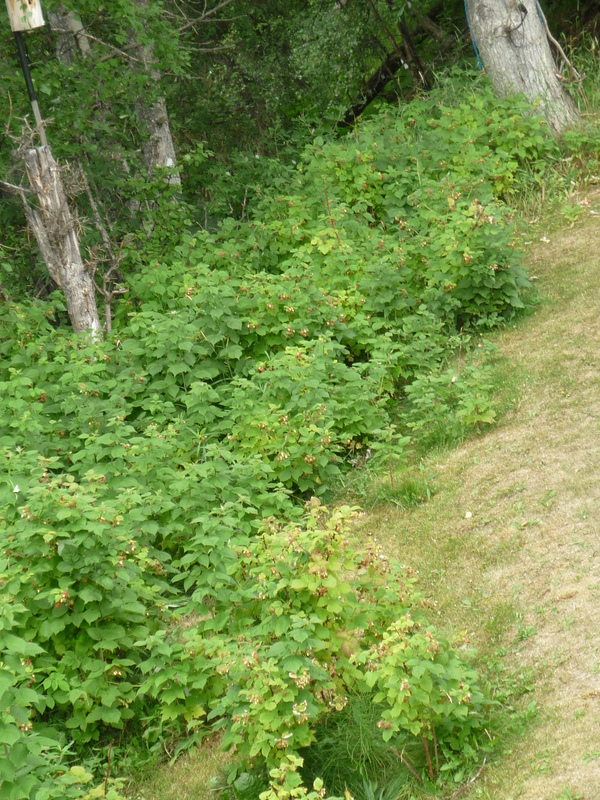 Once again it is raspberry season and I am in the thick of it. My freezer is filling with raspberries. I am infusing two pints of raspberry vinegar. I made a batch of raspberry chipotle barbecue sauce and liked it so much that the next day I made a double batch and canned it. 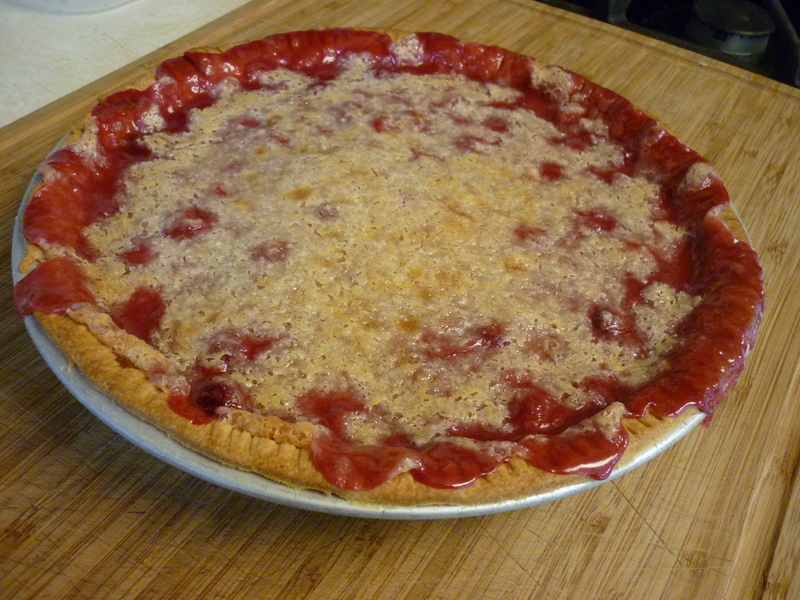 I’ve made two raspberry pies, one of them is this Raspberry Cream Pie that I’m going to tell you about. I found it here (Taste of Home) and it’s really good. It’s light and airy and not too sweet. I used a graham cracker crust instead of the vanilla wafer one called for in the original recipe because I don’t have any vanilla wafers. Sorry about the dearth of pictures. I didn’t think I’d be posting it, but it’s just SO good! Mix together 1-1/2 cups crushed graham crackers with 3 Tbsp. sugar and 1/3 cup melted butter. Press into greased 9″ pie plate. Bake at 350 degrees for 10 minutes. Allow to cool. I prepared the whipped cream in my mixer first, then scraped it into a bowl and set it aside. Mix the softened cream cheese, powdered sugar, orange liqueur, and vanilla extract until smooth. Fold in the whipped cream. 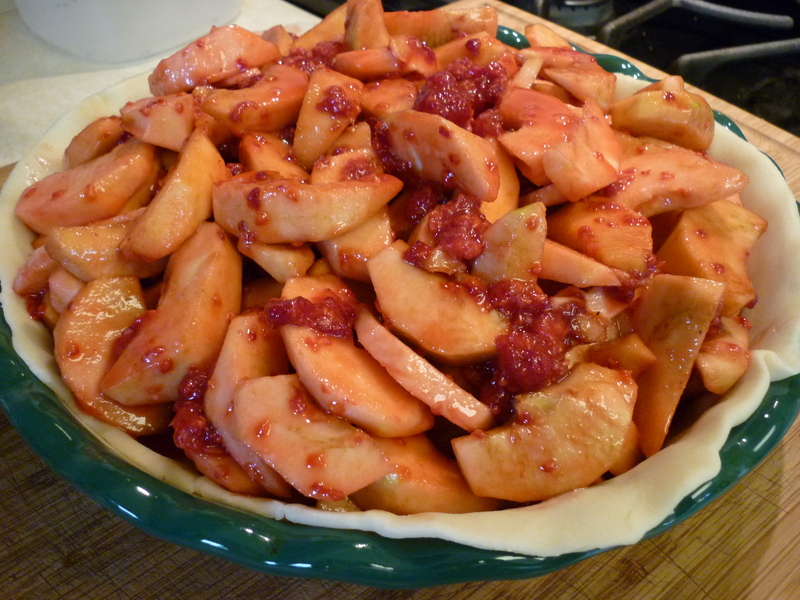 Spoon the filling into the pie crust and chill. Stir sugar and cornstarch together in small saucepan. Add water and raspberries. Bring to a boil, stirring, and boil for 2 minutes or until somewhat thickened. Transfer to a small bowl and chill. 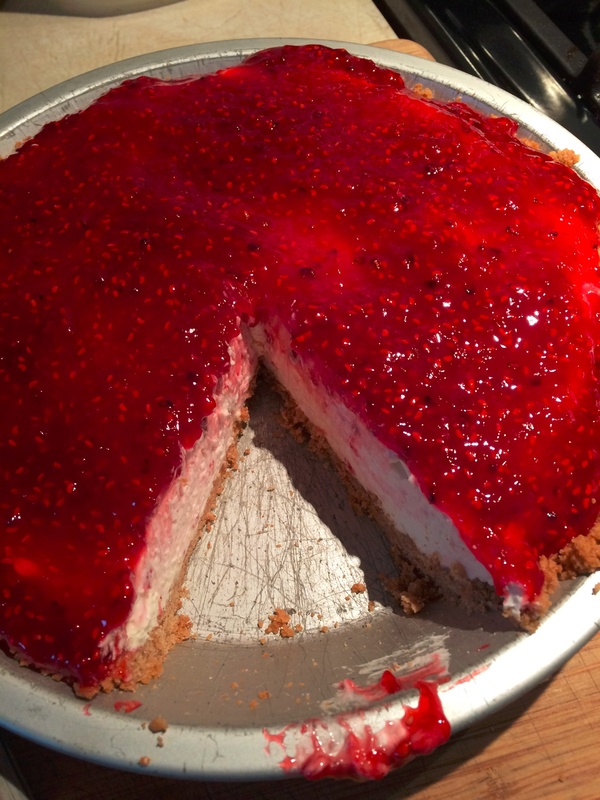 Spoon the raspberry topping over the pie filling. Chill until serving. 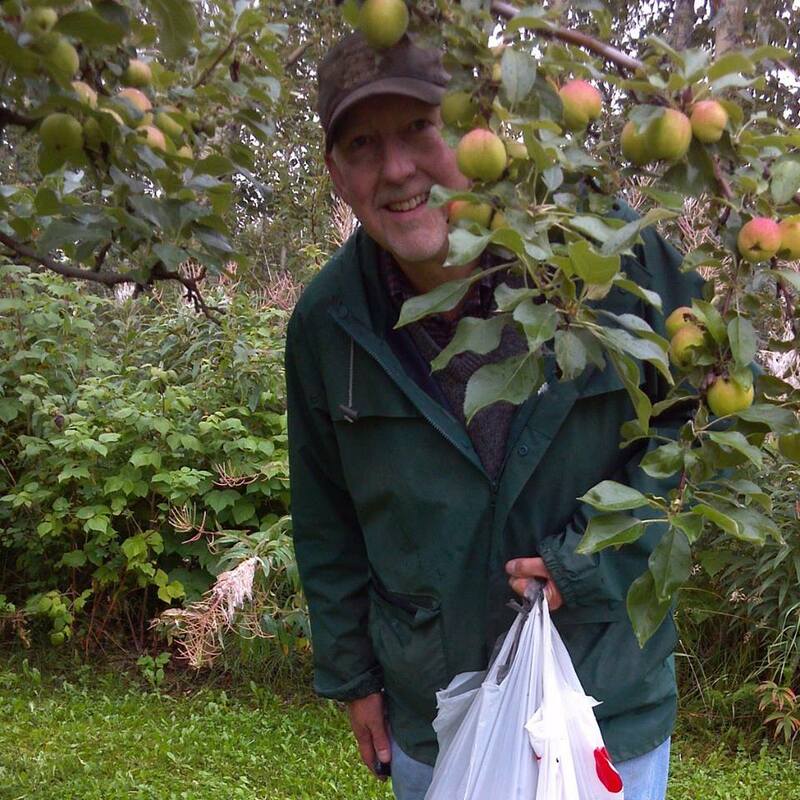 My husband and I picked apples this morning. I’m in Alaska and they’re a little on the small side. 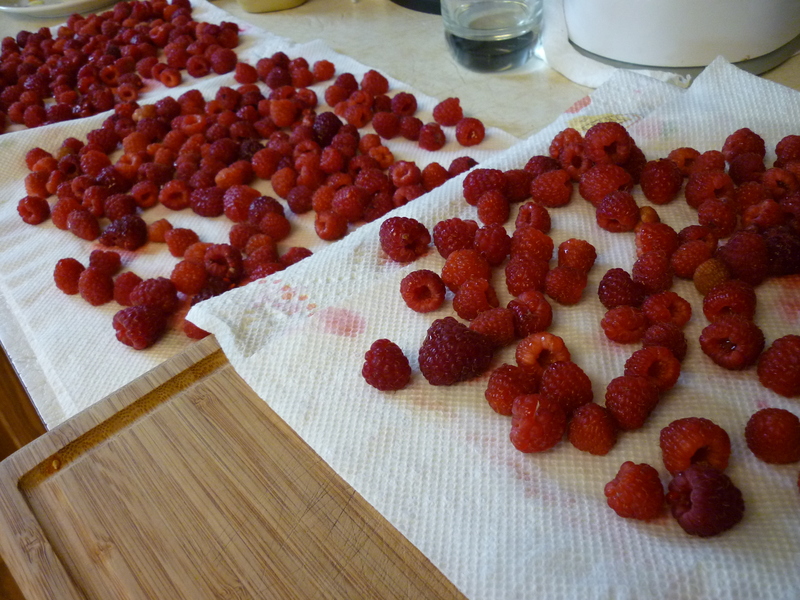 Then I came home and picked raspberries from the back yard. The recipe is based on one from Martha Stewart. So, I went a little rogue with the recipe, but that’s okay. Who knows how many raspberries I threw in there. It looks pretty ugly, but I just tasted some of the dripping and it’s heavenly. I don’t usually peel these little apples, but this time I did. The ones I picked were nearly normal sized and I didn’t know if the peel would be tough, so I peeled. 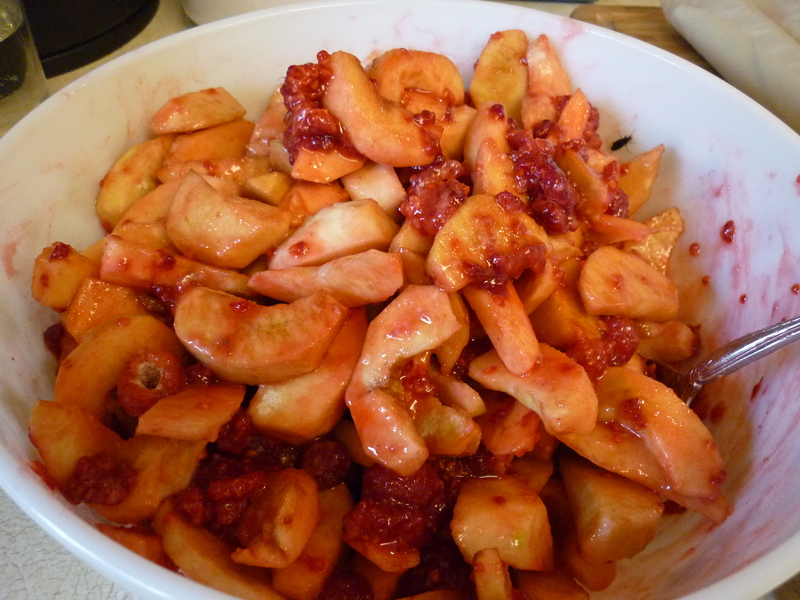 Here’s what you do, preheat oven to 375 degrees F. Mix together the apples, raspberries, sugar, flour, lemon juice, and salt. Pour into pie crust. Dot with butter. Cut slits in top crust. Put on top crust. Mix together egg yolk and cream. Brush over top crust. Sprinkle with more sugar. Bake on bottom rack of oven (set the pie on a baking sheet to catch the overflow drips) for 1 hour ten minutes to 1 hour twenty minutes. I baked mine for 1 hour and 25 minutes. You’re looking for the juice bubbles to burst slowly. Mine seems perfect. Can hardly wait to try it. We are having a BUMPER crop of raspberries. 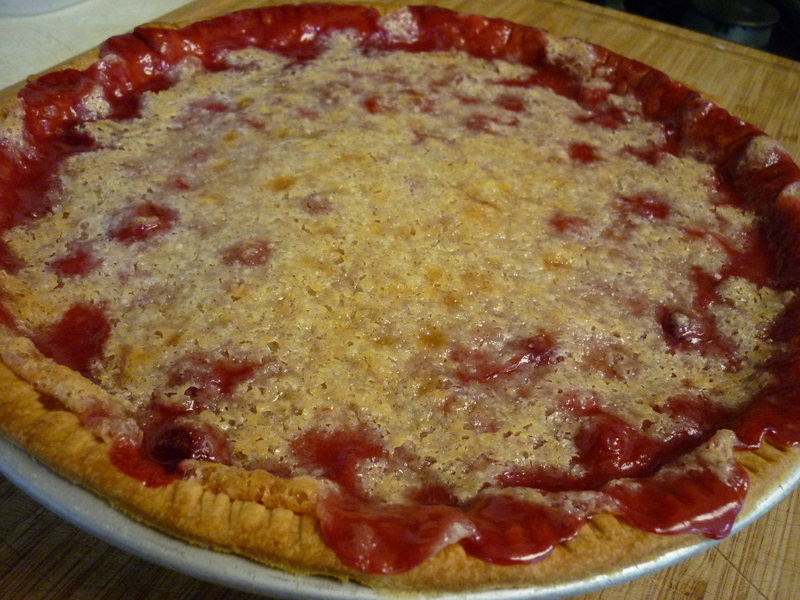 Here is a raspberry pie favorite. 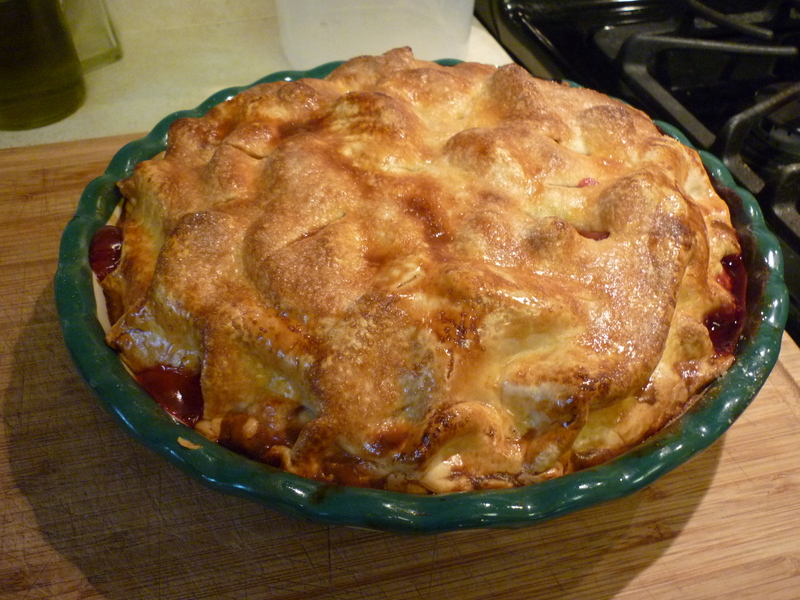 It’s based upon a recipe found in Sunset Magazine’s June 1990 issue called French Raspberry Pie. You’ll need 4-1/2 cups to start. Rinse and then dry on absorbent towel. 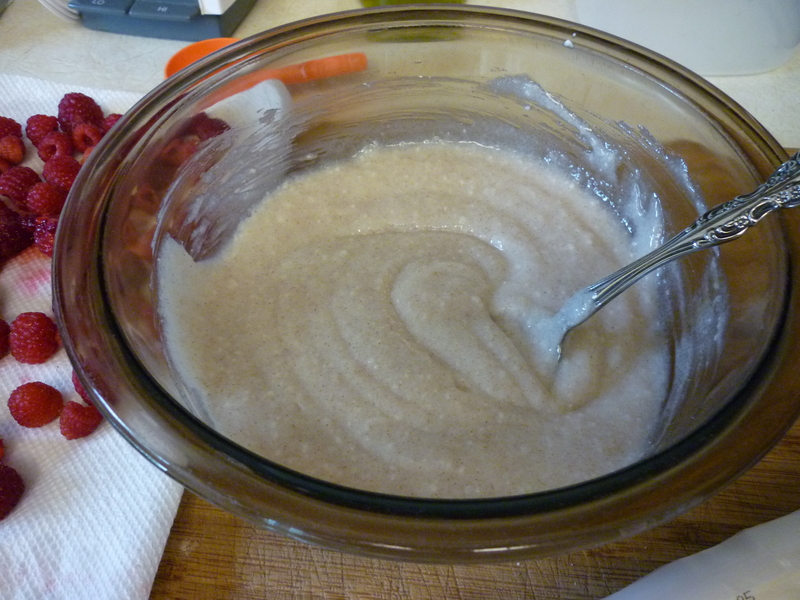 Mix together 1 cup sugar, 1/4 cup tapioca, 1/2 tsp cinnamon, 1/4 tsp. salt. Stir in 1 cup sour cream and let sit for 15 minutes. 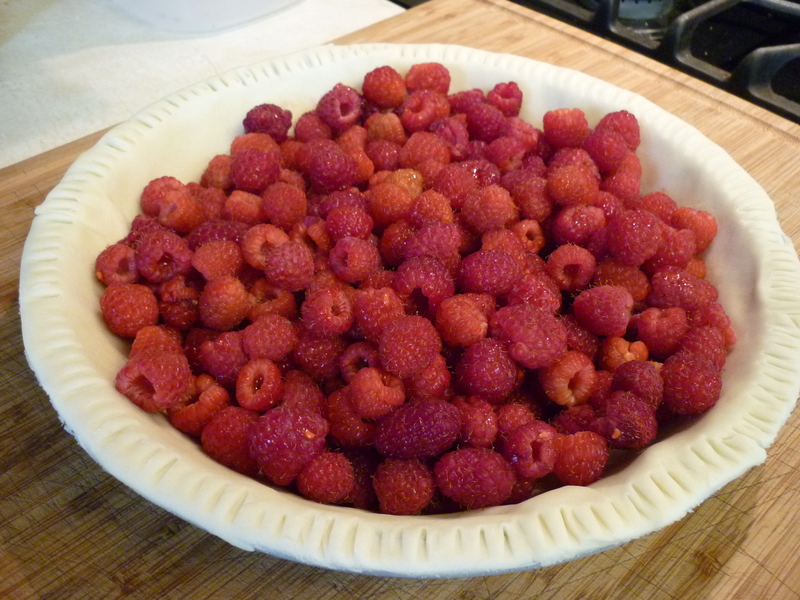 Distribute raspberries into an unbaked 9″ pie crust. Pour sour cream mixture evenly over the raspberries. Set pie on sheet to catch drips. Bake at 400 degrees F for 45-50 minutes. 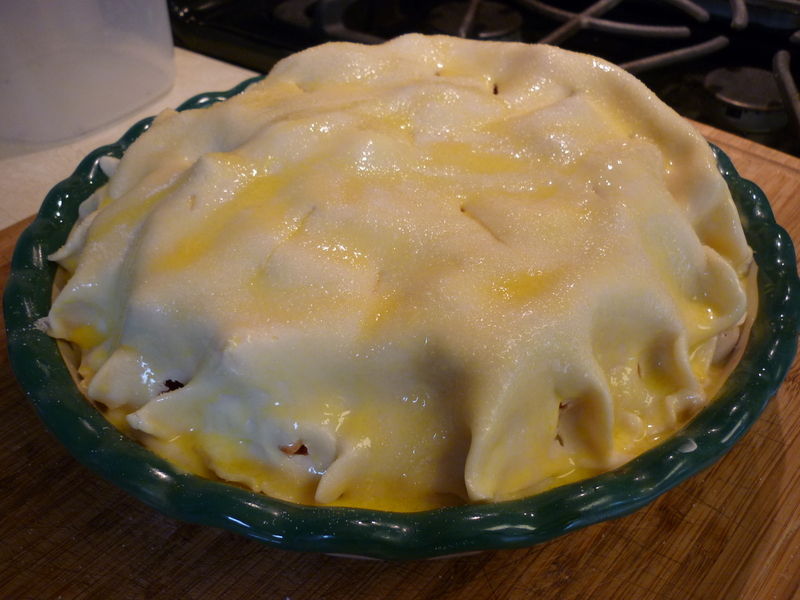 Pie is finished when filling is bubbly and surface is browned. Once cooled, garnish with 1-1/2 cups fresh raspberries. Rinse berries and drain on absorbent towels. 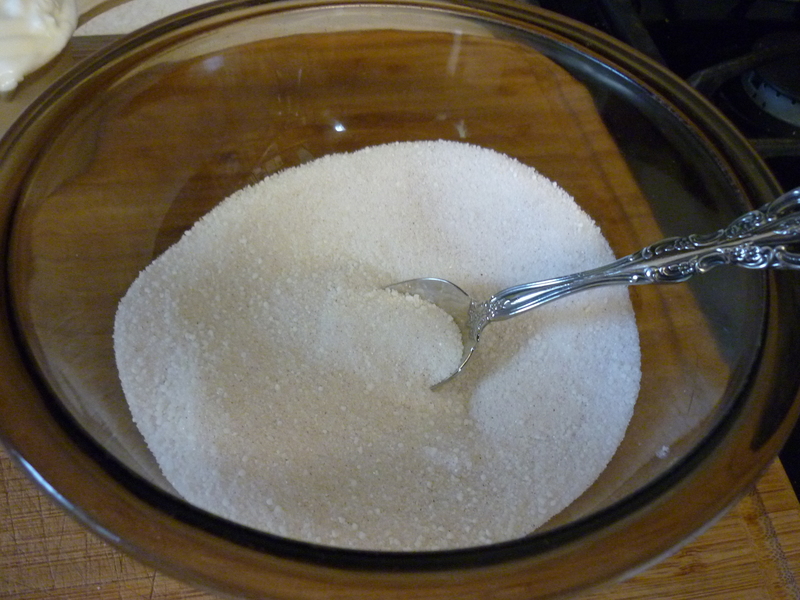 In a small bowl, mix sugar, tapioca, cinnamon, and salt. Stir in sour cream; let stand 15 minutes to soften tapioca. 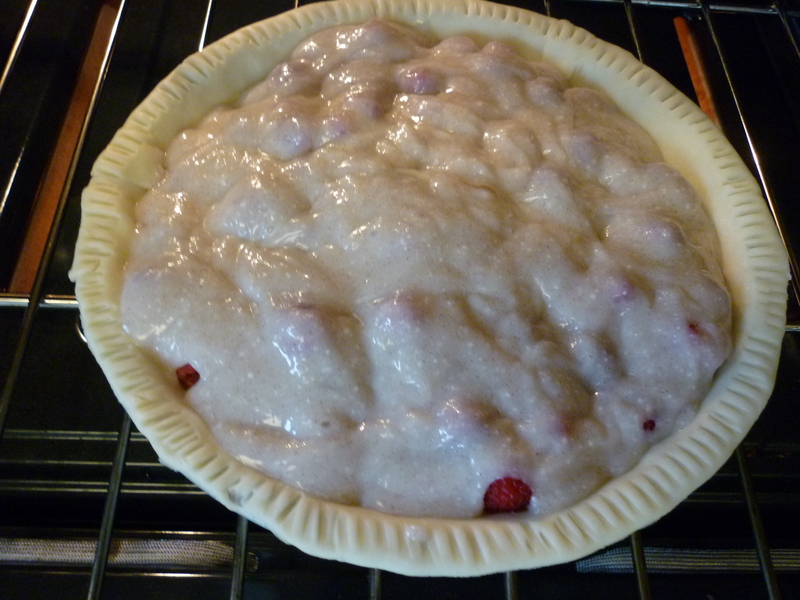 Put 4-1/2 cups raspberries into pastry shell. Pour sour cream mixture evenly over raspberries. Bake at 400 degrees until filling bubbles and surface is browned, 45-55 minutes. Let cool, then pile more berries on top.